Johnson “John” Gideon Bingham (1845-1926), A farmer, town supervisor, and coin dealer who lived at Solon, with a mailing address of McGraw (McGrawville), Cortland County, New York. He was born on June 21, 1845, the son of farmers, Samuel (1806-1891) and Sally Randall Bingham (1808-1890). His family is directly descended from Judge Johnson Bingham (1764-1843), a Revolutionary War soldier who lived in Shaftsbury, Vermont; and in January 1794 removed to Solon, Cortland County, New York. Judge Johnson Bingham is the son of Gideon Bingham (1714-1796) of Canterbury, Connecticut, for whom Johnson Gideon Bingham, the subject of our sketch has received his middle name. Gideon Bingham was a direct descendant of Samuel Bingham who came from England in 1686. Judge Johnson Bingham planted the first apple orchard in Cortland County on his 550-acre farm. His grandson Johnson G. Bingham, kept his grandfather Johnson’s rifle and sword from the Revolutionary War as relics and family heirlooms. The nostalgia of his colonial family together with other various heirlooms he inherited stimulated Bingham to become a collector and dealer in coins and other antiquities. On November 21, 1872, he married Mariah W. Kinney (1851-1928) and they had a daughter, Maud Charlotte (1876-1968). His daughter Maud became a coin dealer like her father. Fig. 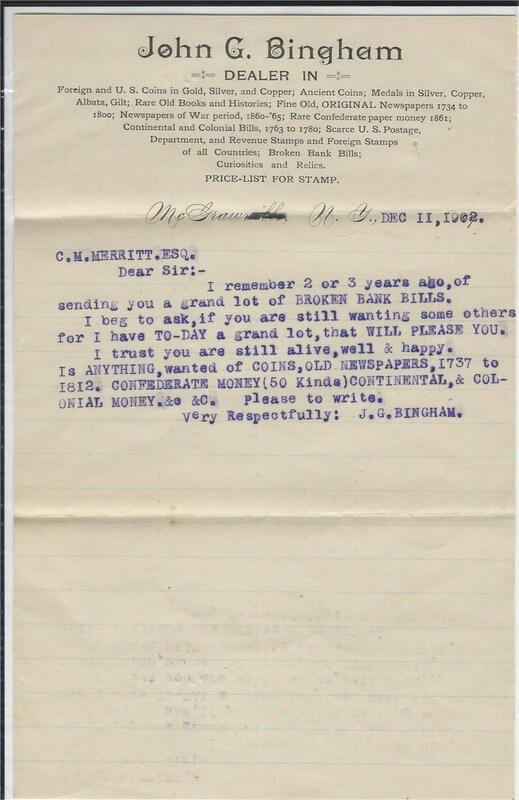 Herbert Ellis Morey to Maud Charlotte Bingham on his mail bid sale, postmarked March 8, 1904, Boston, Massachusetts. Maud Charlotte Bingham married B. Frank Wadsworth in 1903. They had a son Willard. Henry Hechler (1853-1928), postmarked March 26, 1887. Courtesy Lupia Numismatic Library, Coin Dealers file. Bingham's advertisement selling stamps and coins published in Keystone State Collector, Volume 1, No. 1, March, 1888. Courtesy the Lupia Numismatic Library, Coin Dealers File. Johnson Gideon Bingham, is ANA member No. 42 (revised numbering). He was a Mason of the Blue Lodge, Chapter and Commandary. Fig. 2. Letterhead of Johnson Gideon Bingham with letter drawn up to fellow farmer and coin collector Charles M. Merritt. Fig. 3. 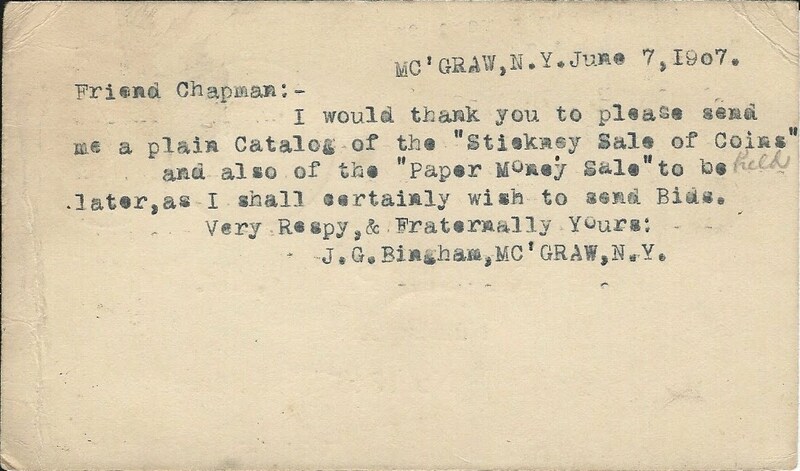 Letter postmarked March 29, 1904 to the Chapman Brothers, well-known coin dealers in Philadelphia, Pennsylvania. Fig. 4. 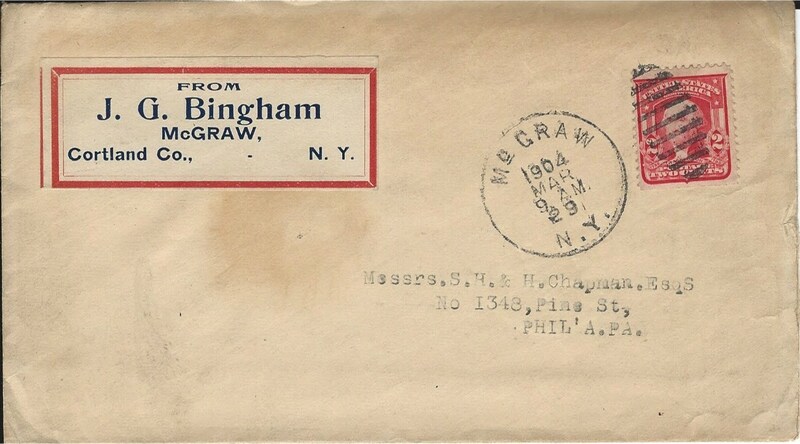 Chapman Mailer return reply postal card sent by Bingham postmarked July 7, 1907, McGraw, N.Y. He was a collector and dealer of U. S. and ancient coins and colonial, confederate and fractional currency, and curiosities since 1860, as well as later on about 1880 as a numismatic writer. He took a trip with wife and family to California in November 1884 and a notice of this was published by Ebenezer Locke Mason, Jr. in Mason's Coin and Stamp Collectors' Magazine. He died April 28, 1926. He is buried in Mount Olivet Cemetery, Halifax, Nova Scotia, Canada. Well-Known Citizen Succumbs to Heart-Attack Was Supervisor of Solon Several Years - Nearly 81 Years Old. McGrawville, May 5 - Johnson G. Bingham, one of the oldest and most respected citizens of this place, died very suddenly at his home on the Solon road last Wednesday. Mr. Bingham's daughter, Mrs. Frank Wadsworth, who lives across the way, saw him fall in the yard about 4 o'clock. She ran to his assistance but lived only a few minutes. He had been subject to heart spells. His age was 80 years, and 10 months. Funeral services were held at the home of his daughter, Mrs. Wadsworth on Friday; Burial in the Rural Cemetery. Mr. Bingham was supervisor of Solon from 1893 to 1900." The Cortland Democrat, May 5, 1926. Some genealogists have his middle name as Gates without any sources cited. Mason's Coin and Stamp Collectors' Magazine, Vol. VI, No. 2, September (1882) : 40; M-I, No. 3, August (1884) : 34; Cited by his initials J. G. B., See No. 7, December (1884) : 79; “Reminiscences of the Travels of a Numismatist,” (Bingham); see also No. 8, January (1884) : 82-84. Common Sense : Devoted to Collectors, Vol. 1, No. 7, November (1887) : Advertisement inside cover . Maud Charlotte Bingham (1876-1968), McGraw, New York, coin dealer in US and foreign coins, paper money and antique newspapers. She is the daughter of coin dealer John G. Bingham. She married Frank Wadsworth in 1903. They had a son Willard.